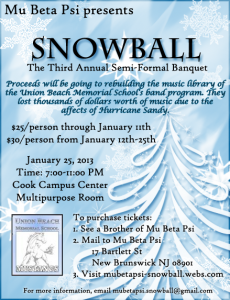 December 4th, 2012 – Mu Beta Psi Presents: Snowball! 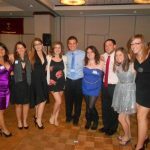 The third annual Snowball is a semi-formal banquet event, and will be held on January 25th. All proceeds for this event will go towards Union Beach Memorial School’s band library bank account. They lost thousands of dollars worth of music due to Hurricane Sandy. Tickets will be $25 until January 11th, and $30 from January 12th to 25th. Tickets can be purchased through a Brother or through the website (linked above). We hope to see everyone there! December 2nd, 2012 – The Pi Chapter welcomes six new members, the Alpha Tau pledge class! The Alpha Tau pledge class includes six members. From left to right: Maria Galarza, Alana Bielski, Kelsea Holton, Gail Hellman, Todd Vaccaro Jr., Ashley Pierce. 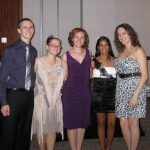 Mu Upsilon Alpha held their 40th Anniversary of serving the Rutgers bands and musical community last night. The celebration, held at the Hyatt Regency Hotel in New Brunswick, featured a cocktail hour, dinner, and dessert. It also included speeches from Brothers throughout the years. Brothers who spoke included three founding Brothers, the current national president Christopher Ciarlariello, and the current chapter president Brian Eichert. After dessert some Brothers hit the dance floor and danced the night away. It was a wonderful celebration to reflect on the last 40 years of music, service, and Brotherhood. 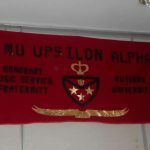 The Brothers of Mu Upsilon Alpha, now Mu Beta Psi, hope to continue these traditions for another 40 years and beyond. The active Brothers will be holding a celebration in honor of Mu Upsilon Alpha’s 40th Anniversary. The celebration will take place at the Hyatt hotel in New Brunswick on November 11th and will begin at 6 o’clock. Invitations were sent out by the active Brothers to all alumni. For more information please contact the current Alumni secretary, Alexandra Henninger. We hope to see everyone there! 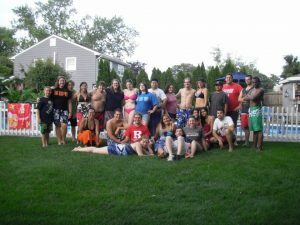 The Rutgers Marching Scarlet Knights had their 2012 band camp from August 25th to August 30th. Some of the Brothers left a day early on August 24th as part of their student leadership roles in order to assist the incoming first-years in their first band camp. 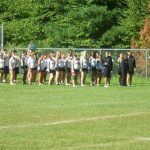 During this time, the marching band put together their pre-game and halftime show for the future football games. The Brothers also held nightly activities for the rest of the marching band so everyone could relax and socialize each night. In all band camp was a successful week for not only the Brothers in the band but also the band as a whole. The band will have their first performance on September 5th when they perform a showcase for friends, family, and staff of Mason Gross. 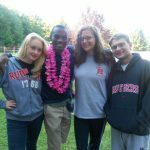 Let’s go RU! 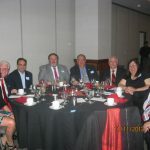 August 4, 2012 – The Second Brotherhood Barbeque! The barbeque was held at Kristin Bevaqua’s house, and included swimming, tons of food, and awesome memories being exchanged and made between the Brothers. It was a great way to wrap up the summer before band camp and school start up once more. Thank you Kristin and her family for hosting this awesome BBQ! See you all next summer! July 23, 2012 – Save the Date, here comes A-Pi-Calypse! 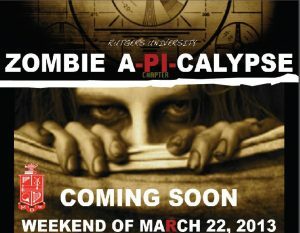 Pi Chapter is proud to officially announce that the A-Pi-Calypse Convention will be held on the weekend of March 22nd of 2013. More information will arrive in the upcoming weeks, so be on the lookout for that. Hope to see you all at the A-Pi-Calypse!!! 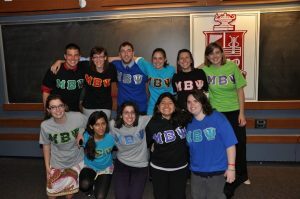 April 15, 2012 – The Alpha Sigma pledge class has been welcomed into the Pi Chapter of Mu Beta Psi! 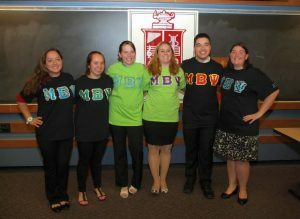 The class was welcomed into Mu Upsilon Alpha and the Pi Chapter of Mu Beta Psi.